Creme Brulee French Toast with Creamy Maple Syrup is a recipe that’s destined to be in your family favorite recipe file! 1. They soak the bread overnight in the egg mixture. (which I found is not necessary) he said the cooks make it in the evening, and they grill it the next morning. 2. A lot of cream is involved. I used half and half in my version. 3. The bread is a brioche loaf. Perfect bread for making decadent french toast. At our local Harmons grocery, the brioche is made with flour, eggs and butter. Top three ingredients, in that order. The texture of this french toast is like a very moist bread pudding, with a little bit of caramelization on top due to the sugar sprinkled on while cooking. The Broiche loaf makes the very best French toast. I love the texture of this bread after it is soaked in the egg and cream mixture and then grilled to golden brown perfection! 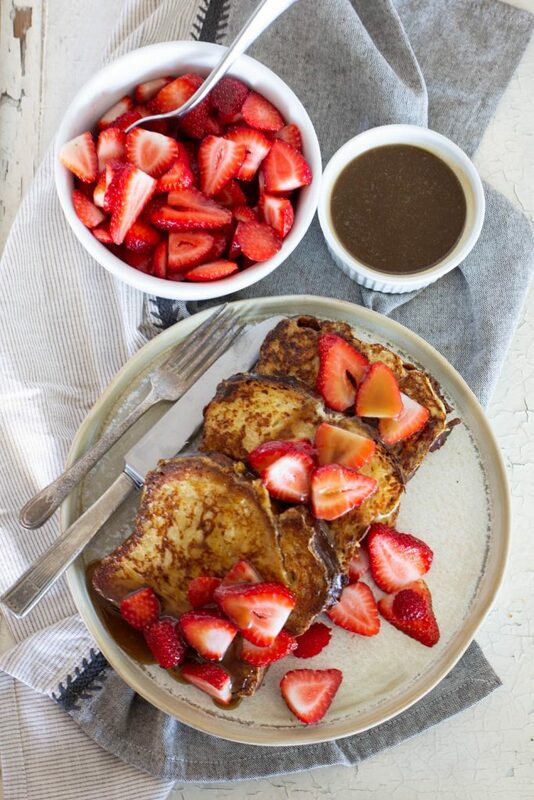 Forget about making French toast any other way after you’ve tried this recipe. It is the best French toast EVER. Trust me, I’ve eaten and made a lot of French toast in my day, and this is the best. Oh, back to the Cheesecake Factory French toast experience! Their French toast was amazing. But the syrup. Oh. My. I could not stop tasting it. I wanted to take a gallon home so I could figure out what was in the buttery, ever so slight maple, creamy mixture. I looked online, but nothing for Cheesecake Factory Syrup. I finally came up with this recipe that is a perfect topping for the Creme Brulee French toast. It takes about a minute to make (YES, one minute!) and you won’t believe how amazing it is on the Creme Brûlée French Toast! Sometimes I make a double batch so I’m sure to have leftovers for pancakes or waffles. If you’re out for breakfast, try the Creme Brûlée French Toast at Cheesecake Factory. If you’re at home this weekend, cooking for your family, try my version. You won’t be sorry! AMAZING French toast, as in best French toast of your LIFE. 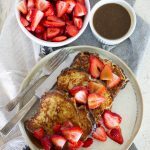 This recipe will spoil you and should come with a warning: No other French toast will ever measure up after you eat this! Beat eggs, egg yolk, half and half, vanilla and sugar together in a 9x13 pan. Place the bread in the pan and let the bread soak up the egg on one side for about 5 minutes, then turn and let soak on other side. If the bread does not fit all at once in the pan, let the bread soak, then remove to plate to allow other pieces to fit in pan. Let any excess egg mixture drip off into pan. Heat frying pan or griddle up to 350 degrees. Melt a small amount of butter in pan. Place french toast pieces in pan and fry until golden on first side. While cooking the first side, sprinkle a small amount of sugar on the uncooked side. Flip and cook other side until golden and sugar is caramelized. Syrup: Place cream, butter and brown sugar in a pan over medium heat. Bring to a boil. Cook for one minute. Remove from heat and add maple extract, dash of salt and vanilla. The cooking time will vary according to the pan/heat source you are using. I use a built in griddle, which gets hotter than the typical griddle (plug in type). I've also used a Teflon pan over a flame. I believe the best crust is formed on the french toast when using a cast iron or other non Teflon type coated pan. This allows the sugar to form a bit of a caramelized layer on the outside of the french toast. That said, this recipe tastes delicious when using an electric griddle with a Teflon coating. If you are cooking several batches you may need to wipe out the pan to prevent the bread from sticking to the melted sugar. Remember to butter the pan after each batch. Remember the bread is thick, and time needs to be allowed to cook the inside of the french toast as well as the outside of the bread. Don't turn the heat up too high, or the outside will burn and you'll be left with a soggy inside. We're looking for tender and creamy, not soggy. You can find Brioche in many specialty bakeries. I have also used a Challah loaf. Store any leftover syrup in refrigerator, covered. It will keep for a month or so. Just heat up when ready to use. Oh my! That looks illegal Si! Yummo! Oh wow!!! This looks SO delicious! 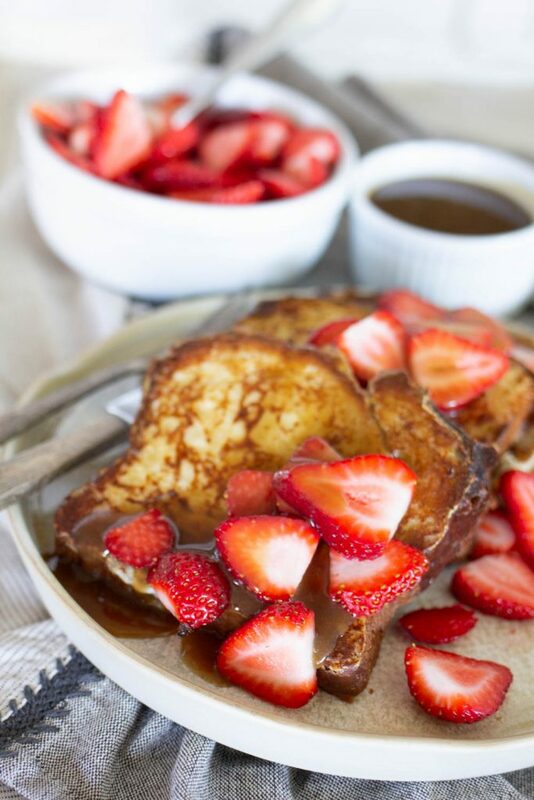 French toast is one of my favorite things to have for breakfast! Have you had their Belgian waffle? It's to DIE for!!! I haven't tried their Belgian Waffle. Next time! Wow SI. 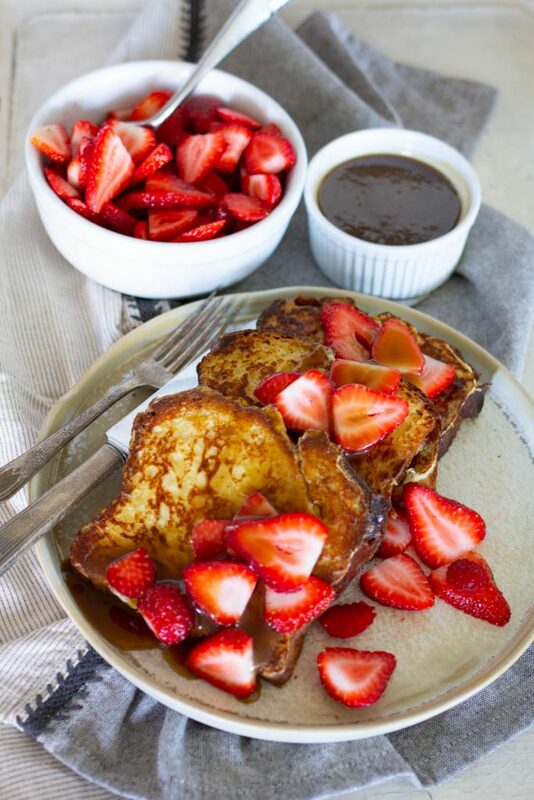 French toast is a favorite of my family and I hardly ever make it. The recipe for your cream syrup looks great. I bet if would be good over apples and pound cake. Hope this isn't a dumb questions, but is maple extract and mapeline the same thing? Crème Brûlée ~ heaven in a dish! I guess you all wouldn’t want to post a calorie estimate for the dish, either Cheesecake’s or the home version? Of course, I know it’s decadent but just how much so? According to the Cheesecake Factory menu on the myfitnesspal app it’s over 2000 calories. But I don’t know exactly how accurate that number is. Ive looked and It doesn’t list nutritional info on the CF website. I can say that the CF brûléed French toast is ABSOLUTELY delicious. I’ve tried this recipe…it’s very good and I’ve also used just brioche bread with regular milk and eggs and regular syrup and it’s still quite delicious and only bout 520 calories for 2 slices. (With butter and light maple syrup included). We had this at the Cheese Cake Factory in Hawaii earlier this month and immediately knew I needed to find a recipe for this so we could enjoy it at home. I made this morning for me and my husband and this recipe is exactly on target. I did soak it all night to make sure the brioche was completely saturated. I plan to add this to my Eastern brunch menu for the entire family. Well done! I’m glad you found this recipe to be just what you were looking for. I try to make my copycat recipes exact. Thank you for your kind comments and thanks for reading ABK. So delicious!! I may have kicked my plate! Thanks, Tiffany! It’s definitely one of our favorite breakfasts to make too.